Read the stories about our volunteers. I sent a previous comment, but I wanted to make sure you are aware of how grateful we are for the work involved in bringing a smile to the faces of children with your wood work. Our 18 month old son was involved in a farm accident and had to have emergency eye surgery. PTL he is doing perfectly fine. But I will never forget the smile that came to his face when one of the nurses at TGH gave him a wooden helicopter. Among all the scary things for a baby to endure in a hospital, your helicopter made us all smile in the midst of stress, worry, fear etc. Thank you for being a blessing to us! His little helicopter is one of the favorites in his playroom! Thank you again. My son was in the ER at Tampa General 2 weeks ago for an asthma attack. He was given one of your wooden cars and it was such a wonderful distraction for him. He played with it his entire hospital stay and still does to this day. Just wanted to thank you for making a difference! What a wonderful thing you are all doing. Thanks again! Comments: On Friday 6-14-2013 my wife and I had taken our 2 ½ year old son Nathan to the Tampa children's museum. After a wonderful visit we decided to let him run around the fountains out front. Unfortunately he collided with another child and hit very hard on the back if his head. EMS was called and he was transported to Tampa General. Nathan was slightly less than responsive and could not stop crying obviously in pain. I cannot tell you how helpless I felt watching my son and wife be put into the ambulance, my wife in such distress. After arriving to Tampa General and being reassured by the doctors that Nathan would be fine, I finally broke down. Nathan was still not responding well when one if the nurses brought in a small handmade wooden ambulance painted white with a red cross on it. Nathan immediately changed states to what we are so used to seeing... a vibrant and happy child. Within minutes he was walking around saying hello to everyone, ambulance in hand. Your toy was a God send, without it he would not have recovered so quickly. It is amazing how something so simple can impact someone so greatly. God bless you all for all you do for all of the children in need. Your gift is truly magical. I just wanted to send a note of Thank You!! My son went to Tampa General Hospital with a head injury from a fall. He was very scared and not talking much which for him was not normal. He is a very talkative 5 year old. The nurse came in and gave him this wooden green tractor and the biggest smile ever came over his face and he never put it down. What you are doing is a blessing and I thank God for each and every one of you. Once again thank you! "Please note: there was a mis-print in the following article... our correct email address is toys@toymakersofeastlake.org"
ToyMakers Make Handmade Toys for Children Who Could Use A Smile! What would you do to bring joy to a child? One who is scared, hurt,sick or lost? It may seem hard to believe, but right here in the Tampa Bay Area, there are children in hospitals,orphanages and situations where smiles don’t come very easily. In fact,the volunteers at Toy Makers of East Lake have given away more than 13,000 handcrafted wooden toys and cars in 2016 alone! Volunteers give many of the toys directly to children in Tampa Bay Area hospitals, while others are donated to organizations and first responders with the goal of giving a smile to the children who need one most. It may seem like a simple gesture,a handmade car to a child, but a toy like this is far more than a carved piece of wood, painted tires that spin,and a splash of paint. These cars remind children to hope, to dream, and to laugh. Read more of this article from the December 12, 2016 Tampa Bay News and Lifestyles. PALM HARBOR – Camouflaged amongst the trees, ToyMakers of East Lake sits in an unobtrusive location in the Tarpon Woods neighborhood of East Lake. Toymakers is a nonprofit, volunteer based organization that produces hand-made wooden toys to sick or in need kids in stressful situations. 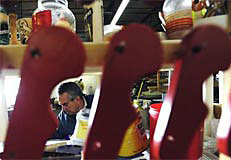 The original ToyMakers group began in Pasco County in 1982. Since then, the charity has moved to its current inconspicuous location in Palm Harbor. Read more of this article from the Aug 11, 2016 Palm Harbor Beacon . Join ToyMakers of East Lake and Help Bring Smiles to Those Who Need Them Most! The ToyMakers of East Lake are hard at work all year round, making beautiful toys for children by hand. Their goal is simple. To bring joy to a child, to see a smile spread across that little face, little pudgy hands grasping the wheels and watching them turn. They want to see older children race their car across the floor, or turn their therapy lesson into a game. Their only goal is to make a child happy, if only momentarily, while they’re at the hospital, or at a shelter, and to remind them that everything is going to be okay. That’s what children need to know when they’re going through a scary time, and these volunteers help to create these moments, one “Batmobile” or “Daisy Car” at a time. Read more of this article form the July 6, 2016 East Lake Area Neighborhood News & Lifestyles. Come Join the fun at The ToyMakers of East Lake’s Open House & Silent Auction! Mark your calendars, and spend the morning with The ToyMakers of East Lake on Saturday, November 7th, for they will be hosting an Open House and Silent Auction at the East Lake United Methodist Church just off of East Lake Road. Free and open to the public, please feel free to bring the entire family, including the little ones who will receive one of the Toy- Makers famous handmade toys! The Open House includes a tour of their recently expanded toy making workshop, which is usually closed to the public, as well as an opportunity to get to know the many amazing volunteers who have turned their handiwork into good works. Everyone will enjoy the silent auction, which will include everything from one-of-a-kind, handmade items, to gift certificates to local businesses and tickets to Florida attractions! Read more of this article from the October 9, 2015 East Lake Area Neighborhood News & Lifestyles. PALM HARBOR – Bob Helms calls them his little elves: 220 volunteers that flit in and out of the workshop throughout the day, week and year, building wooden toys by hand. Except they don’t just work in December. Some come once a month, others weekly. Some are there every day. “Our youngest volunteer is 13 and our oldest is 95, and we’ve got everything in between,” said Helms, the president of the ToyMakers board. And every day, dozens of these volunteers sit around the ToyMakers of East Lake warehouse, running down a detailed checklist to put together wooden toys that are then donated to hospitals, police stations and other nonprofit organizations. Read more of this article from the September 10, 2014 Palm Harbor Beacon. In a small building tucked behind East Lake United Methodist Church, saws and planers hum and a large dust collector roars. This spacious workshop is a beehive of activity. Here, almost every morning until noon, the Toymakers of East Lake work their magic, creating sturdy wooden toys for children in distress. Tables and shelves are laden with the fruits of their labor. Small white police cars with tiny decals replicating official police symbols, small blue helicopters, white ambulances bearing red crosses, and colorfully painted trucks, puzzles and hand-held toys for toddlers are heaped on tables. Shelves hold rows of black batmobiles. All are ready for delivery to children being taken to hospitals or shelters, or being removed from abusive or hostile homes. "We make thousands of these," said club president Bob Helms of the batmobiles. "They are really popular with kids." Read more of this feature article from the March 18, 2014 issue of the Tampa Bay Times. I'm not sure that you have any idea what a difference your wonderful wooden toys make for the children we take care of in Tampa General Hospital's Children's Medical Center. Those of you who have come here to deliver the toys, though, must have an idea. Read more here of the letter. The ToyMakers of East Lake is Making Smiles One Toy at a Time! In this world there are precious few who truly put their talents towards helping others, without the expectation of pay or press, and without specific season. The ToyMakers of East Lake are an amazing group of men and women who donate their time, their love and their talents to creating toys for children in the hopes of simply bringing a smile to their faces while they are in the hospital, recovering from an illness, or facing distress of any kind. These ToyMakers of East Lake are busy elves all year long, making thousands of toys for children with only the hope of a child’s happiness as their return. Read more here of the article from the 2014 East Lake Area Neighborhood News & Lifestyles. Volunteers make old-school toys for kids throughout Pinellas. A handful of people, all volunteers, are spending the morning in an old golf shed chipping away at small chunks of wood, fashioning them into cars, fire trucks and letters of the alphabet. One paints wheels; one mans the band-saw; another smoothes the surface of the old-school toys with sandpaper. As part of the ToyMakers of East Lake, the volunteers are making a batch of toys they will deliver throughout the year to local children's hospitals, fire departments, women's shelters and other nonprofit organizations as far away as Gainesville. Jon Little, now in his sixth year crafting toys, jokes that the work helps retirees such as him stay productive. "Keeps us off the streets," he says. Read more here of the article from Tampa Bay Online. As I looked down at the altar that past Father's Day Sunday morning, it appeared to me that a traffic jam had somehow materialized on the top of it. Cars small and large, ambulances, and school buses appeared to be stalled in some kind of silent and blessed gridlock. Their attempts to move forward were thwarted by vehicles going the opposite way. "Dear Lord," I began the blessing. Read more of the article from the August Northern Illinois Conference News. An 11-year-old girl at Tampa General Hospital's pediatric rehabilitation center in Tampa, Fla, had a metal helmet held in place by screws in her skull. A rope ran to a bar above her wheelchair and kept her neck stabilized. Although she had much to be discouraged about, she was thrilled when people from nearby East Lake United Methodist Church came to visit. Representing the ministry ToyMakers of East Lake, the church members distributed handmade toys. "I asked her if she had come there in a helicopter," ToyMakers' President Bob Helms says. "When she said 'yes, 'I asked her if she'd like a toy one." The girl's face lit up, and Helms was able to connect with her during a difficult time, he says. Read more of the article from the July/August Outreach magazine. Eighteen volunteers from United Health Care came to the shop to make toys! Scott Wiggs, UHC Billing Supervisor, was responsible for setting up this event with Toymakers of East Lake. “Our participation yesterday was the result of our United Volunteers program called “Days of Service”. 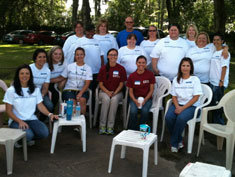 UnitedHealth Group encourages its employees to volunteer within our communities. Everything went extremely smooth as a result of our veteran Toymakers’ efforts!